LOS ANGELES, CA--(Marketwired - September 17, 2015) - Hollywood veteran Brian Bird -- writer and executive producer of Paramount Pictures' star-studded feature film CAPTIVE -- is joining the inspiring new sports drama, TOUCHDOWN ON THE TUNDRA, as an executive producer and will partner with WGA Award-winning writer, John Wierick, in penning the script. From CineVantage Productions, TOUCHDOWN ON THE TUNDRA is the true story of a high school football team in desolate Barrow, Alaska, 300 miles north of the Arctic Circle, where a group of isolated Native Iñupiat young men find new hope and purpose in a controversial football program championed by, of all people, a Florida football mom named Cathy Parker. News of Bird and Wierick's attachment to the project comes as the NFL Network, this Thursday, launches an eight-episode series on the team, "Football Town: Barrow, Alaska." The team was the subject of a highly respected documentary by ESPN. "TOUCHDOWN ON THE TUNDRA is far more than a sports story," Bird said. "From opposite ends of the continent, two mothers take on an impossible challenge in the planet's most remote town. In the process, a generation of young men gain entirely new life purpose. We're thrilled, first, to help write this remarkable story, and then to bring it to the big screen." In more than three decades of writing and producing, both Bird and Wierick have specialized in life- and faith-affirming films and television. They will team to write the screenplay based on an earlier script by Marshal Younger and Torry Martin, and the book "Thunder on the Tundra" by Lew Freedman, along with the true story of Cathy Parker -- the Florida mother whose faith, grit and determination helped change the fortunes of Barrow and its citizens. Parker -- a coach's wife and working mother of four in Florida -- saw an ESPN documentary about Barrow's bleak existence and its diminishing hopes, particularly among its young men and women. Quixotically, when asked what would give them hope, the school kids, who were playing the outdated Madden '98 video game, answered: "Football." At the time, they played on a Permafrost and gravel field, and had to post snipers at practice to ward off polar bears. 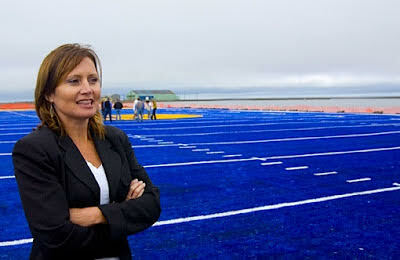 Parker determined not only to bring the Barrow players to Florida to train with her husband's high school team, but to build the Alaskans a first-class artificial-turf field. TOUCHDOWN ON THE TUNDRA is the amazing, true story of how Parker teamed with concerned Iñupiat mothers in Barrow to become unlikely heroes to convince local authorities that football was the solution to the town's social ills and a whole generation of young men." "If it weren't for Cathy Parker and some brave mothers in that town, there would be no Barrow football program. It's that simple," CineVantage Productions Producer Honnie Korngold said. "Now Brian and John are on a team to bring her unlikely and true story to everyone." Los Angeles and Denver-based CineVantage Productions develops and produces feature films for family audiences. With a foundation in non-fiction television production, Producer Honnie Korngold founded CineVantage in 2009 and has grown it to a burgeoning independent film company producing feature films and documentaries committed to stories of inspiration and hope.